St. Augustine’s is the class of the field on both sides. Bowie, MD (May 6, 2018) – The Falcons of Saint Augustine’s University swept the men’s and women’s titles at the Central Intercollegiate Athletic Association (CIAA) Outdoor Track and Field Championships at Bowie State University on Sunday. The outdoor sweep is the first for the Falcons and Lady Falcons since the 2015 season. This year, they also swept both men’s and women’s indoor and outdoor conference titles for the first time in the same year since 2010. Saint Augustine’s University claimed its 21st straight men’s outdoor conference crown and 38th in 40 seasons after entering the day trailing by 25 points to Virginia State University in the two-day meet. The Falcons finished the meet outscoring Virginia State 202-189 for the championship. Virginia Union University was third with 78 points followed by Lincoln (Pa.) University (61), Johnson C. Smith University (47), Livingstone College (37) and Bowie State University (35). Saint Augustine’s University won its 15th women’s title in 22 seasons and first since 2015 after starting the day in fourth place. The Lady Falcons outdistanced themselves 157-155 from second-place Virginia State University. Bowie State University was third with 87.5 points followed by Shaw University (83), Winston-Salem State University (77.5), Johnson C. Smith University (38), Livingstone College (35), and Lincoln (Pa.) University (20). Kyla Frank of Virginia State was the Women’s Track Most Valuable Performer and Magaly Tshipopo of Saint Augustine’s won Women’s Field MVP. Frank won the 1500m run and was second in the 800m run in addition to helping the 4x400m relay team place third. Tshipopo swept the long jump, high jump, and triple jump. For the men, Brandon Valentine-Parris of Saint Augustine earned Men’s Track MVP honors and Justin Williams (SAU) took Men’s Field MVP. Valentine-Parris won the 200m and 400m dashes and was a member of the winning 4x100m and 4x400m relay teams. Williams won the triple jump and finished third in the long jump, tied for fourth in the high jump, and placed fourth in the pole vault and javelin throw. The winners in the men’s events were Shaquille Dill of Saint Augustine’s (800m run, 1500m run), Chazton McKenzie of Virginia Union (long jump), Dakarai Hightower of Saint Augustine’s (high jump), Xavier Ivey of Virginia Union (shot put), Dajawn Williams of Virginia State (pole vault), Najair Jackson of Saint Augustine’s (javelin throw), Jahvante Marcelle of Virginia State (110m hurdles), Valentine-Parris of Saint Augustine’s (200m dash, 400m dash), Justin Williams of Saint Augustine’s (triple jump), Damere Gilbert of Saint Augustine’s (100m dash), Timor Barrett of Johnson C. Smith (400m hurdles), Tyreece Huff of Virginia State (5000m run) and Solomon Potter of Lincoln (PA) (discus). Saint Augustine’s won the 4x100m and 4x400m relays. The winners in the women’s events were Tyefah Saunders of Shaw (javelin throw), Tshipopo of Saint Augustine’s (high jump, long jump, triple jump), Jeia Gilliam of Virginia State (shot put), Frank of Virginia State (1500m run), Shakera Hall of Saint Augustine’s (100m hurdles), Shannon Kalawan of Saint Augustine’s (400m dash), LaCherie Clarke of Shaw (100m dash), Kaydi Ann Wint of Shaw (800m run), Kianje Pollard of Johnson C. Smith (400m hurdles), Amanda Crawford of Saint Augustine’s (200m dash), Imani Travis of Winston-Salem State (3000m run) and Jeia Gilliam of Virginia State (Discus). 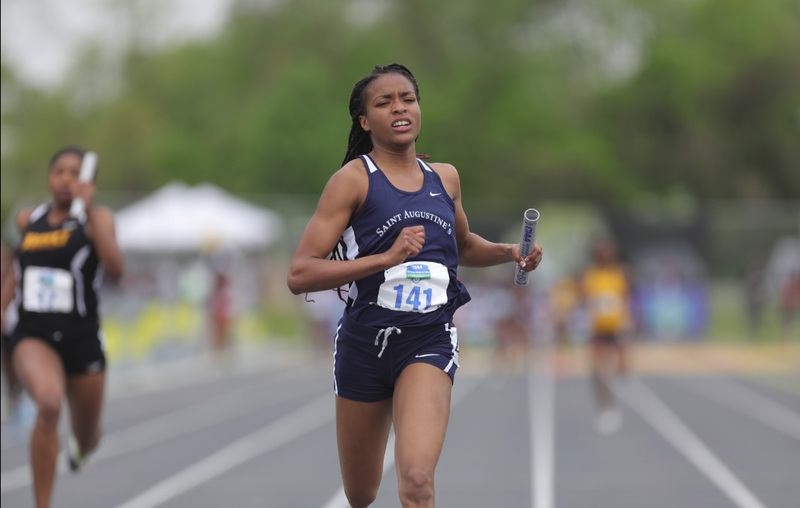 Saint Augustine’s won the 4x100m relay and Bowie State won the 4x400m relay. NCAA Division II Outdoor Track & Field Nationals will be held May 24-26, 2018 on the campus of Johnson C. Smith University in Charlotte, North Carolina. For more information on NCAA Division II Nationals, visit www.ncaa.com. For more information about CIAA Track & Field Teams, visit www.theciaa.com.